As previously discussed, boxiness is sometimes the most basic shape. This breakdown is very boxy, very basic, and doesn’t really look all that attractive. 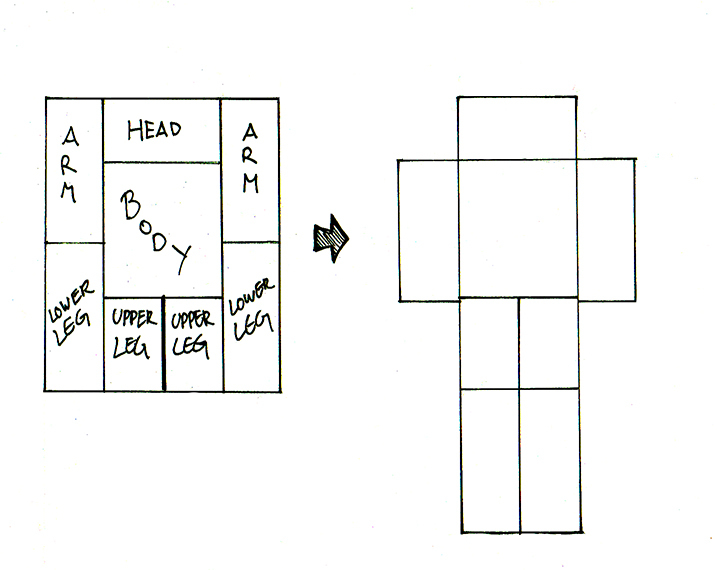 The above is just a 2D repositioning of the box’s areas. This is barely just the first step, as we need depth and sense how the transformation happens. However, a man doesn’t really look like this. As mentioned, a mecha really is an exaggerated geometrically portrayed humanoid. The head for example is far too wide, the arms are stocky without hands and legs don’t have feet. 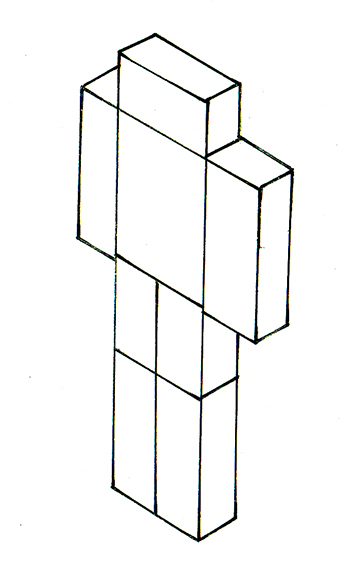 The torso is also just one block. So, let’s disregard the box for a moment and adapt humanoid elements to Boxtron. Let’s disregard the base standing position too. I decided to keep the wide head. Giving it a wide visor and slightly mess with other dimensions give Boxtron slightly more balance. Managed to screw perspective all the while. 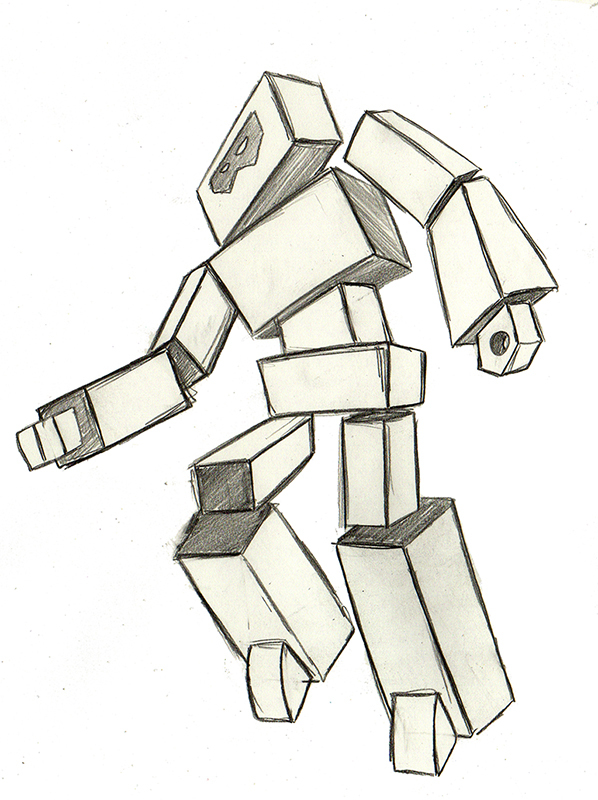 Our robot looks a bit more pleasing now with more humanoid proportions, but due to lack of design details and everything else, Boxtron is still the most applicable name. It also lacks joints and cohesive transformation scheme. Of course, using a car or something more applicable would be a better target, but let’s try a stupid simple transformation outline for our Boxtron. We’ve now turned a box into a robot. The joints that I didn’t care to separately draw in are the same simple joints we’ve discussed earlier with simple rolls, pivots and double joints. While Boxtron is still a box, it’s now a box with some definition to it. This transformation would be Toyetic on the scale I use. 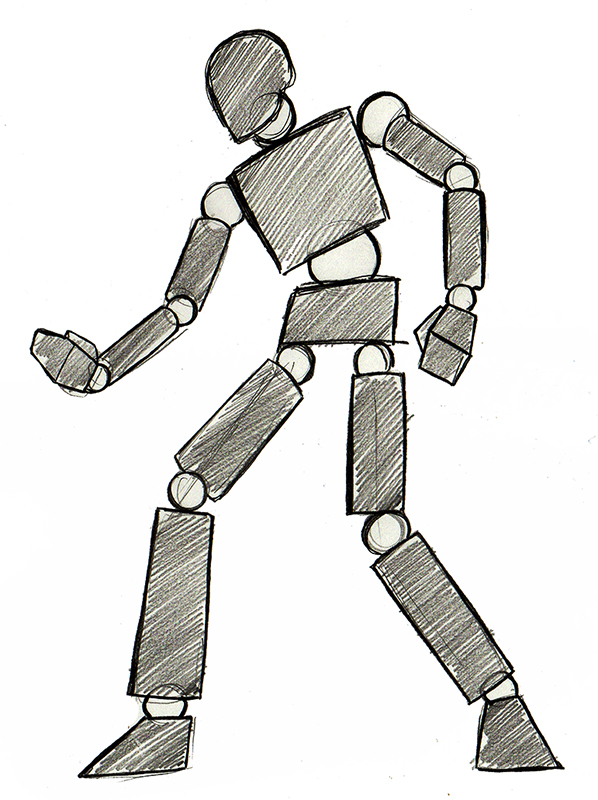 It would work on both paper and in a toy, but in reality there would be issues with the legs twisting from the side, and arms and torso popping out like that. This Boxtron of course lacks any and all detailing, what it really is when it’s a box, but that could be anything from a Zippo to something like a spare pocket power battery. The head of course could see some work done to it, with section of it turned into a backpack or something with smaller visor, but for the sake of simplicity let’s keep it big and blocky. 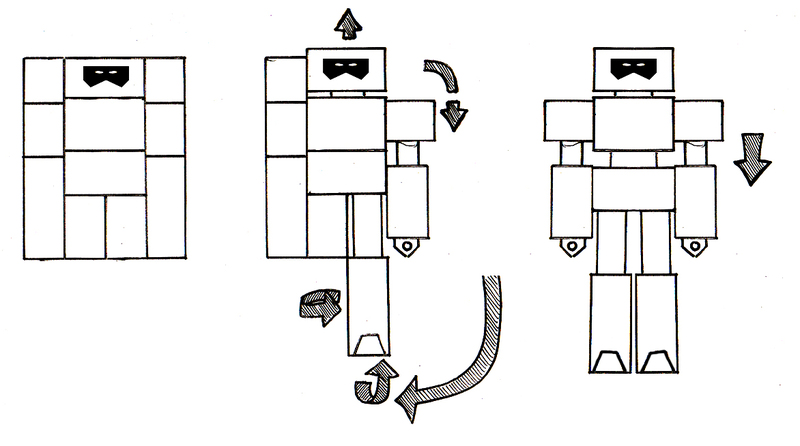 This being a very simple way to turn a cube into a robot, it can be generally applied to anything in similar sense for simple transformation. Some of the older Transfromer’s cars used something similar to this, except they didn’t extend the torso and just extended the legs. Sometimes the hood was flipped back. Essentially, they were made to “stand up” from the “laying on their face” position. With Boxtron I made the legs twist to the side and the attach to the side of the mecha. The added shoulder armour flips down as well and the arms are extended from it. The hands are pulled out from the arms as well. Feet are flipped up from the legs. Little things like this do not only make the mecha more pleasing to the eye, but also a lot more enjoyable to toy with on paper. Simplicity isn’t exactly a bad thing. Overly complex transformation tends to make fragile objects, both in and out of fiction (unless you’re a Super Robot that doesn’t care.) I have to admit that even this example has some problems in its transformation, but as an example it suffices. Nevertheless, whatever sort of transformation this would be, it needs to be exciting. That’s the whole point of it all, really. You can have a bland transformation like this, but when you put something into it. For toys, something like a battery effect that lights the eyes for a moment when the head is pulled up or something simple as ratchet joints that click pleasantly to the ears while giving satisfying tactile feedback to the hands does the trick. For animation and comics there needs to be the cool factor in there, with music, posing and situation, the while “man’s romance” thrown in there in one scene. Even a simple transformation from a box to a robot can make an impact when made right. It’s all about how the design and surrounding work works. Posted on 22/02/2017 23/02/2017 by aaltomiesPosted in DesignTagged design, how to design mecha, mecha, mecha design, robots, transforming mecha.